Huge digestion tanks are at the heart of a system designed to turn cow manure into biogas at Rosendale Dairy. The UW Oshkosh Foundation is prepared to sell its Rosendale biodigester for just $2.1 million but has scheduled an auction for later this month to see if other offers come forward. The foundation affiliate that built the biodigester owes $8.5 million to 14 creditors, according to documents filed in Fond du Lac County Circuit Court. The largest creditor is First Business Bank, a Madison-based lender that is owed $7 million. The second largest is the foundation itself, which is owed $1.2 million. The sale would represent a big loss on the biodigester, which cost at least $6.7 million to build and has also been described as a $10 million project. But a successful auction would mark a critical step in resolving the foundation’s bankruptcy case and possibly mending relations with the university. “It moves things along,” said Tim Mulloy, the foundation’s chairman of the board. At one point the foundation was criticized for getting involved in a range of real estate projects, but most of those would be off its books after the Rosendale sale. Only two troubled real estate investments would remain in the foundation’s portfolio, a smaller biogester off Witzel Avenue near the UW Oshkosh campus and the school’s Alumni Welcome and Conference Center. Those facilities “really make sense for the university to have in their asset base long term,” Mulloy said. As previously reported, the foundation has wound up its role in financing the Oshkosh Sports Complex and found a buyer for the historic residence it purchased for use by the UW Oshkosh chancellor. Another investment, in a downtown hotel, has been profitable. Part of the Rosendale court file is a “stalking horse” bid from a unit of Phibro, a Connecticut-based commodities company that used to be known as Philips Brothers and operated for a time as an arm of finance giant Citigroup. The Phibro bid, described as $2.1 million in one place and as slightly higher on another page, represents the minimum amount that the foundation would accept for the Rosendale facility. At least one other bidder has expressed an interest in the biodigester. That firm is REV LNG, a Pennsylvania company that specializes in hauling liquid natural gas. The court filing provides some insight into the financial performance of the Rosendale biodigester. For example one balance sheet entry indicates that retained earnings are a negative $5.8 million, suggesting accumulated losses of that amount since it was officially opened in 2014. Another entry refers to the “biodigester plant,” which is apparently a reference to the tanks, pumps and pipes that are used to turn cow manure into biogas. These are shown as an asset worth $4.6 million with accumulated depreciation of almost $2.4 million. The net value of these two figures is roughly $2.3 million, slightly more than the stalking horse bid. The auction is scheduled for Aug. 27, but what happens next is not clear. First Business, the main lender, could continue its efforts to recover the balance of its loan by pursuing the foundation in bankruptcy court. The foundation, meanwhile, has been arguing that the state of Wisconsin is ultimately responsible for any losses because the biodigester was built on behalf of a state school and with promises that UW Oshkosh would cover any associated bank debt. The state disagrees, and a federal bankruptcy judge is expected to rule on this dispute later this year. 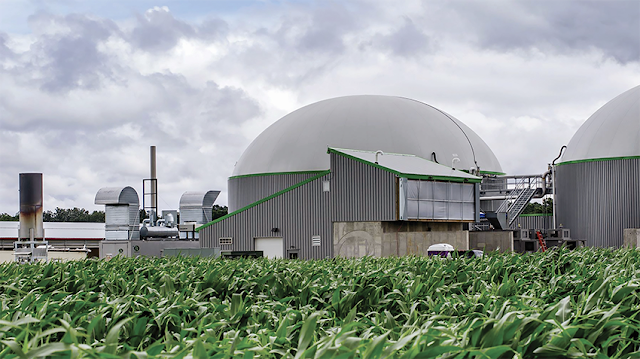 The biodigester operates at Rosendale Dairy, whose 8,000-plus cows make it the largest milk producing farm in the state. If Phibro is the successful bidder, it plans to fire all of of the biodigester employees. Most of them would be rehired "on such terms as [Phibro] determines in its sole discretion," a court document states.